For nearly two weeks, I’ve been glued to my Twitter feed and Facebook updates via my friends in Istanbul and throughout Turkey. Since I called Istanbul home for nearly three years, it’s been heartbreaking to watch all the news unfold about the Gezi Park protests, which started on May 31, and not be there. Several of the protests occurred literally in our former backyard of Beşiktaş. The tear gas would have seeped into our apartment building. 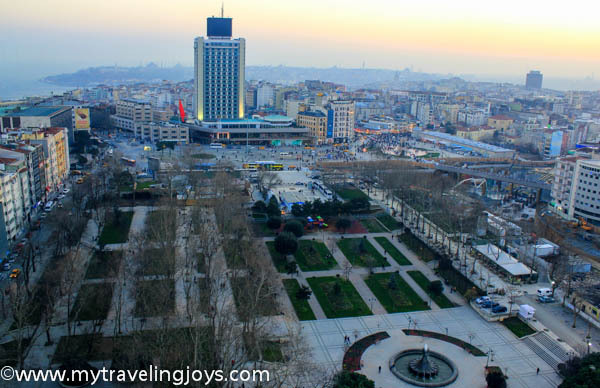 A view of Gezi Park in Istanbul's Taksim Square as seen from the Intercontinental Hotel's bar. Taken in February 2013. I want to march with my friends. I want to proudly wave my Turkish flag. I want to be çapuling on the streets too. I wasn’t going to write about the protests, but I don’t see how I could NOT write about them either. The nationwide protests are not just about a small park being destroyed for a shopping mall anymore. At the heart of the matter is fundamental rights that us Americans take for granted – freedom of speech and the right to peacefully assemble. Everyone should have these basic rights. Instead, these people are shot down with tear gas canisters, plastic bullets and water cannons because they are standing up to the government for these rights and much more. 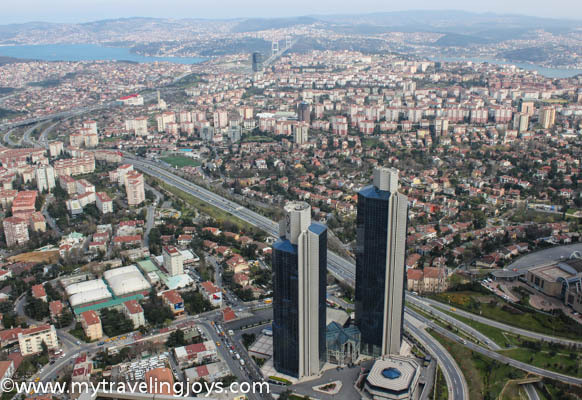 Before we left Istanbul, we re-visited the Istanbul Sapphire, the city’s highest building in the Levent neighborhood. 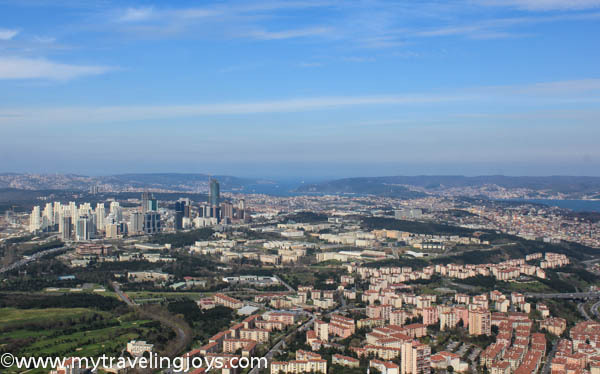 Although there are many locations to view this beautiful city, the Sapphire gives you a different perspective since you can see all the way to the Black Sea, Sea of Marmara and along the Bosphorus. 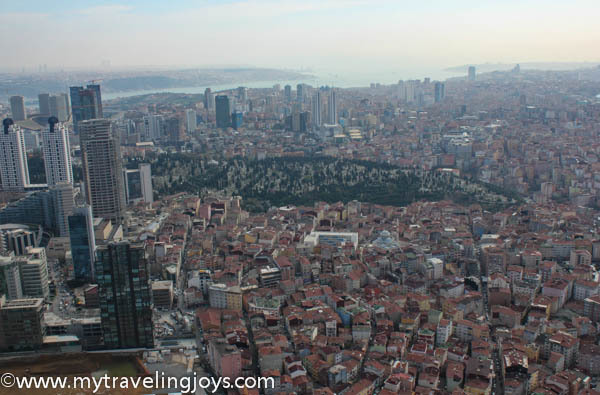 My husband’s Turkish colleague, an Istanbul native, joined us on the viewing terrace and remarked that most of the city’s remaining green space is cemeteries. How sad! She’s right! The city is a concrete jungle. Here you can see the "green space" of the cemetery in the Şişli neighborhood. For a city of 15 million people, it has very few parks, and Gezi Park is one of the few remaining green spaces in the middle of this crowded city. Looking north, I guess there's still a little green space left by Maslak too. As Istanbul continues to grow and expand, developers buy up any remaining green space and turn it into high-rise apartments. The city doesn’t seem to have any urban planners especially as construction begins for the city’s third bridge over the Bosphorus and the third airport. More than 2 million trees would be destroyed for these projects and could be a ‘threat to the city’s future,’ according to news accounts I’ve read. I have to wonder, at what cost, does a city like Istanbul continue to develop? Will the new bridge and airport clog up the city even more? Will there be any parks left for my friends’ children to play in? Will Belgrade Forest even remain? Although I’m no longer living in Istanbul, my heart is still there. Must be frustrating for you to be away, Joy. We're in Turkey but frustrated, too. Fethiye feels a million miles away from all of this right now. It messes with your head - normal life continuing amongst all of this. Every 'normal' thing we do makes us wonder how we can be doing normal things...if that makes sense. As I said - messes with your head and ours are all over the place right now. @Julia, Yes, but I can understand your comments too. Friends in Istanbul aren't sure what "normal" is - is the normal before the protests or the current normal since the protests? Just trying to pay attention as much as I can from here! sad thing is that there is now no room for compromise between an intransigent PM and the 'other half' of this country. His combination of venom and vindictiveness seems reason-proof. I know how you feel Joy, being away from a city you love and trying to make sense of it all - and no sense - London is amongst the cities where the real estate is the most expensive, yet the city is surrounded by lush parks.. that is a sign of civilization. Hope and wish the country we love live the way it deserves - do enjoy your trip to Istanbul! @Alan, you make a good point! Hard to say what's going to happen! @Julia, Thanks for your nice comments! What an experience to teach your kids! Being an outsider from the protests does give you a different view, but I still miss being able to support our friends in Istanbul too. I can only hope for the best for our former "home" country!